With its large cow structure in front of what used to be an old warehouse, the San Diego Public Market is not something to be missed. It may not look like much from the outside, but once inside, visitors are treated to an array of yummy food, fresh produce and hand crafted goods. Located in the Barrio Logan section of town, the San Diego Public Market has become a destination and an oasis in an area of old warehouse space and weed filled lots. San Francisco has Fisherman's Wharf, Seattle has Pike's Place Market and Boston has Fanueil Hall and now San Diego, with its year long growing season and vibrant food community has its very own public market. Dreamed up as a collaboration between Catt White and Dale Steele, the two prominent San Diegans who decided that the time was right to make their dream a reality. Deciding on the Barrio Logan area, the duo started to clear and transform the space so it could become a true foodie destination. Catt White, one of San Diego Public Market's founders, has long been helping set up community farmers' markets in San Diego and conceived of the idea for a more permanent location with developer Dale Steele. Together, the two with their gumption and connections, made the project a reality, using a Kickstarter campaign, in part, to get things going. The project was a success and the plan has been on the fast track ever since. The market is a combination between a mega farmer's market and a more traditional bazaar with both fresh produce and product vendors sharing the space. Right now, finishing touches to the Public Market's infrastructure are just about complete but vendors are happy to be selling their wares among the final touch ups. Combining open air as well as covered space ,the San Diego Public Market will house both permanent food and product stalls as well as allow for temporary set ups. Vendors lease the space from the Market and visitors get to meander along the stalls, tasting and browsing as needed. Today visitors and residents of San Diego alike can come on down and browse the diversity of vendors. Catt White wants to keep the Market's rent reasonable so smaller producers can have a stall right next to the big names. The San Diego Public Market is a great space for unique food vendors and local farmers to set up and sell their wares. It also allows hungry and discerning San Diegans the chance to browse, taste and buy from all different types of vendors, like gourmet sausage producer T&H Prime Meats, delicious cupcakes from bakeries like Sweet Lydia's and even fine soaps and lotions from Purity Apothecary. The San Diego Public Market is a great way to experience the vibrant San Diego food scene. 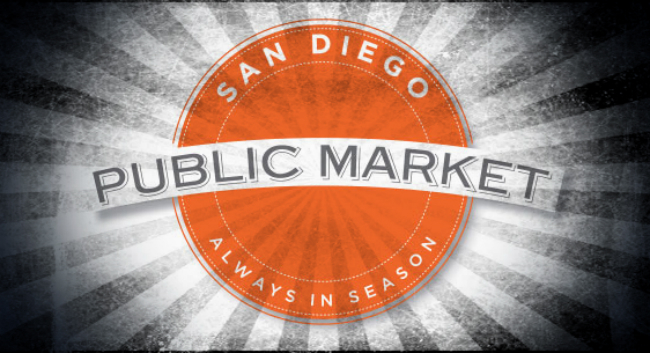 Right now the San Diego Public Market is open on Sundays and Wednesdays from 9 am to 2 pm and is located at 1735 National Avenue. With its eclectic mix of vendors, the San Diego Public Market is sure to be a fun filled destination for just about anyone who appreciates fine food - or just loves to eat.